Hingham Mill Corner towermill stood in a small yard by the road and was built of tarred red brick for Philip Pitts in 1829, which is recorded on a datestone inscribed PP 1829. The 6 storey mill ran 3 pairs of stones that were powered by 4 double shuttered sails, each with 8 bays of 3 shutters that were stuck via a chain pole. The boat shaped cap had a petticoat and a gallery. The fanstage at the rear of the cap held a six bladed fan with a cradle underneath. A stage was set against the second floor. The jockey wheel for tensioning the slack belt for the sack hoist ran in a carriage on a track. On Tuesday last George Oakley, aged 14 was committed to Norwich Castle for 14 days for stealing a pair of scales and a beam, the property of Mr. George Waller Pitts, miller & baker of Hingham. On Tuesday afternoon about half past three o’clock a violent tempest accompanied by snow, hail & rain passed over this town & the electric fluid was seen to strike the top sail of Mr. George Pitt’s mill & was conveyed along the iron shaft from thence to the sack tackling, the chain of which acted as a conductor to the earth, the continuation being kept up by a nail through the floor & upon which the chain rested. A man & a boy were standing at the time upon the ground floor of the mill but did not receive any hurt; neither did the mill or any part of its machinery. WANTED immediately, a respectable Man as BAKER, a good Dough Maker. Apply to G.W. Pitts, Hingham. WANTED a Journeyman MILLER. None need apply without a good character. Apply Mr. G.W. Pitts, Hingham Mill. WANTED, a steady active Man with good character. Apply to G. Pitts, Hingham, Attleboro'. WANTED, a JOURNEYMAN MILLER of good character for Wind & Steam Power. Apply to G. W. Pitts, Hingham. WANTED, an Apprentice to a MILLER & BAKER. Apply G.W. Pitts, Hingham, Attleboro’. 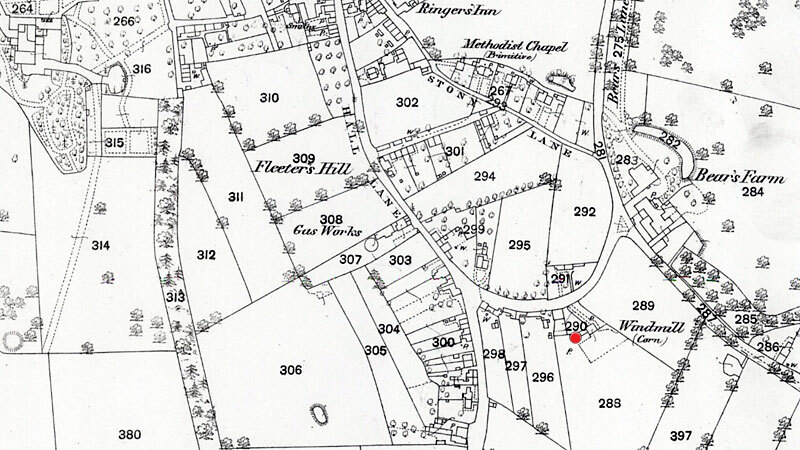 S. Mealing Mills (late Stockings & Mills) is instructed by the Mortgagees to Sell by Auction at the White Hart Hotel, Hingham on Tuesday June 23, 1885 at 5 for 6 in the Evening, in Seven Lots, the following Valuable FREEHOLD PROPERTIES centrally situated in Hingham. Five Enclosures of excellent Accommodation Pasture & Arable LAND containing 12a.3r.0p. A very substantially built Brick Tower WINDMILL of Six Stories, with Cottage & Premises. Two Valuable old POLICIES OF ASSURANCE. Messrs. Bailey, Cross & Barnard, Surrey Street, Norwich, Vendors’ Solicitors. To Millers, Corn Merchants, Bakers, Dealers, Investors & others S. Mealing Mills (late Stockings & Mills) is instructed by the Mortgagees to Sell by Auction at the White Hart Hotel, Hingham, on Tuesday June 23, 1885 at 5 for 6 in the Evening in Seven Lots. Containing Six Stories & drives Three pairs of Stones, with yard, Garden, capital COTTAGE & Premises occupied by Mr. Barber, together with the small Dealers occupation adjoining with Premises & Enclosure of productive Arable LAND containing 2a. 0r. 29p. occupied by Mr. Bilham. 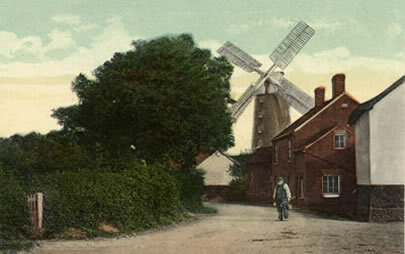 The above Mill, to which there is a good trade, stands in an excellent situation at Hingham about Five Minutes walk from the Market Place & about Three Miles from Hardingham & Kimberley & Five from Attleborough Railway Stations. It is in good repair, the Sails are in capital order & a new Stock has just been put up. Particulars may be obtained at the Offices of the Auctioneer, Orford Hill, Norwich & of Messrs. Bailey, Cross & Barnard, Surrey Street, Norwich, Vendors Solicitors. 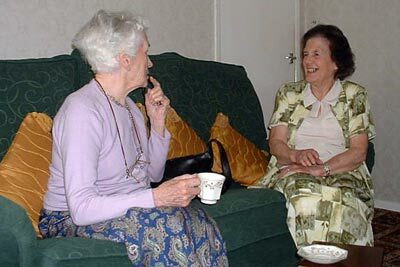 The above left photograph shows Vera Woolacott née Pitts with her cousin Ruth Christmas, also née Pitts. Arthur Phineas Pitts, Phineas Pitts, Alfred Ernest Pitts, Helena Pitts, Ada Pitts. Ruth Christmas is the baby in her Mother’s arms. The photo is of Ernest Pitts (my grandfather’s older brother), his wife Annie and five daughters in 1923. On the left is Ada Pitts and on the right is Phineas, Father of Ernest and Ada. My Mother says the woman behind Phineas is Annie’s Mother but I think she looks very attached to Phineas if that’s the case! Jenny Giles has sent me your marvellous website of Hingham Mill from Perth in Australia. I am in contact with Jenny because her husband is descended from Robert Pitts, brother of Philip Pitts who built Hingham Mill, and she is researching the Pitts family tree. My Mother is the great-great-granddaughter of Philip Pitts. Her grandfather, Phineas Pitts b. 3 Feb 1843 d. 1927?, was the son of John Pitts b. 2 Oct 1809 d. 13 Jan 1887, the eldest son of Philip Pitts the miller. My Mother’s Father was Arthur Phineas Pitts b. 1 Dec 1879 d. 1966, the third son of Phineas Pitts. My grandfather’s early childhood was spent at Old Hardingham Hall where his Father, Phineas, was a farmer. Sadly, Phineas went bankrupt in 1887 approx when cheap wheat was flooding in from the New World and the farmers had no protection because of Free Trade. Phineas and his family took a hotel in Dovercourt but the work was said to have killed his wife, Louisa, and she died age 49 in 1895. Arthur Phineas, my grandfather, stayed in the milling trade and became Sales Manager of Ranks Flour Mills in Southampton. He knew J. Arthur Rank and was actively involved in the planning of a new mill in Southampton in the 1920s or 30s. Apparently, the plans for the mill were kept in my grandparents’ home while it was being built. Strangely, my Mother did not know about the family windmill until I discovered it although her Father did take the family to visit Hingham when she was a child. 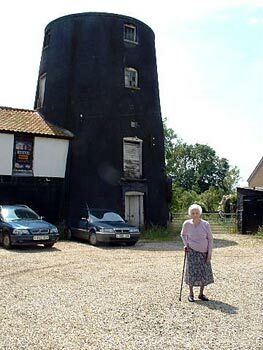 I took her to see it in 2005, when she was 92, and attach a couple of photos of her standing in front of the mill. Her name is Vera Woolacott (nee Pitts) b. 18 March 1913 and still going strong. I also attach a picture of my Mother with Ruth Christmas (b. 14 Sept 1923) in Colchester in 2005. Ruth is another great-great granddaughter of Philip Pitts and first cousin of my Mother. She is the 5th daughter of Alfred Ernest Pitts b. 4 Aug 1878 d. 10 Aug 1956, my grandfather’s older brother. 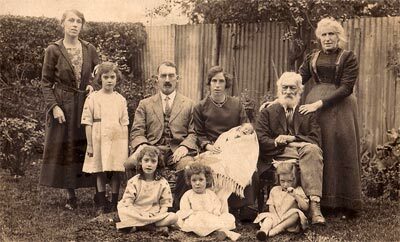 The final photo is of Phineas Pitts with my grandfather on the left and Alfred Ernest (always known as Ernest) and their two sisters, Helena and Ada. I think this photo is approx 1897-8. 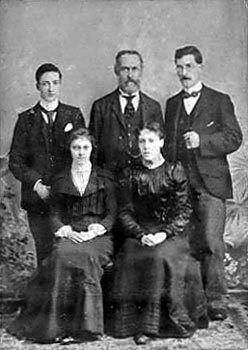 The eldest brother, Herbert, is not in the picture - he was a clergyman in Norwich and Chessington, Surrey. 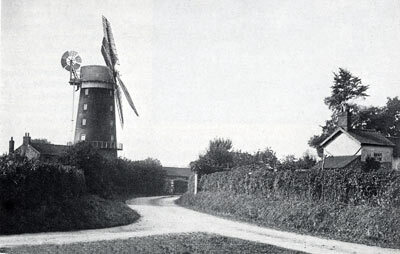 The above photograph shows Vera Woolacott née Pitts standing in front of the mill once run by her great great grandfather. After the sails had been removed a store was built against the side of the tower. In 1973 the tower was reduced to 3 storeys. William Samuel Barber was born on 22nd August 1837 and died on 1st December 1916, aged 79 and was buried in Hingham cemetary. He was succeeded at the mill by his stepson, John Watling until c.1908. A photograph taken during WWI shows four Red Cross nurses from Bears Farm Hospital, a lady in black and two men standing on the stage. 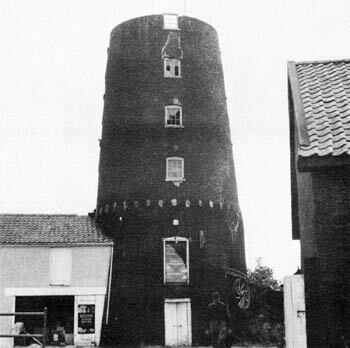 c.1958, James Long of the Mill House wrote to Harry Apling to report that Sometime after dismantling one stock was used for Pakenham towermill in Suffolk. In 1974 Philip Unwin recorded that, James Long once of the Mill House, owned a painting by Hoye in 1883, that depicted the mill with the engine shed doors open showing a portable steam engine with a belt drive to the mill. Kelly's directory of 1908 and 1912 records the mill as being powered by wind and gas. 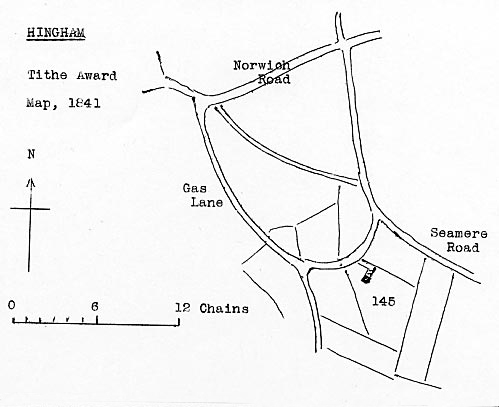 This would have been town gas as Hingham had its own gas works from 1871 until shortly after World War I. 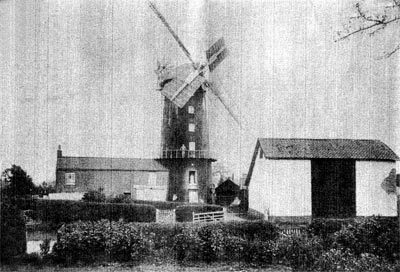 However, the Gas Company failed several years before electricity came to Hingham although the mill had already converted to running on oil by 1916. ... Hingham ... a fine big towermill of the black-brick Norfolk pattern, but the sweeps & fantail had recently been dismantled, & a row of yawning holes told of the gallery which had embraced the huge body - another fine fellow come to rest. My name is Brian Foster I am 56 years old my Great Uncle was born in Oak yard & in later life lived in Pitts Square off what was then called Gas Lane; his name was John Thomas Foster, his father in law was Phillip Gapp the Blacksmith. John Foster was born in May 1873 & died in April 1964 he was a great Hingham man & is buried in Hingham cemetary, He was the eldest of 5 brothers all born in Hingham I only knew him & his next youngest brother Alfred who had a shoe menders shop in Hingham & after the 2nd war he repaired shoes in Oak Yard which he had bought the houses where he was born. My Grand father was the youngest brother born in 1883 he came to London in 1901 but died in 1948. My mother & father with me & my older sister used to go to Hingham many times for holidays I loved it so much I wanted my parents to move there. We still visited Hingham up until my fathers Death in 1993 (died in James Paget Hospital). One of my cousins Anne Houghton was housekeeper to Alan Breeze & her Father worked for Burts the Bakers all his adult life, his name was William Foster the Baker. I hope this is of some interest my sister & I were always fascinated by the Windmill. William Barber b.1779, my GGG Grandfather was miller at Jay's_Green_Tower_Mill between 1830s - 1851. His son Samuel Barber b.1811 was also at Jay's_Green in 1839, then in 1845 - 1864 he was Miller at Scole_Tower_Mill. 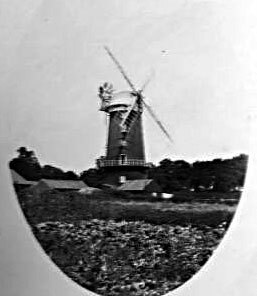 His son William Samuel Barber b.1837 was Miller at the following: 1861 - Eye, 1871 - Gissing, 1881 - Rockland All Saints, 1891 - Hingham and between 1878 -1879 William appears to have been at Carlton_Rode_Tower_Mill. William was at Hingham until 1904, his Step-Son Robert John Watling was recorded as miller up to 1908. 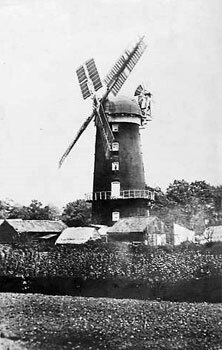 Robert John Watling moved from Hingham Mill Corner towermill to Cringleford_watermill, where he remained until it burnt down in 1916. He was also listed at Saxlingham Thorpe in 1922 and 1925.